The Hundred Schools of Thought (Chinese: 諸子百家; pinyin: zhūzǐ bǎijiā) were philosophies and schools that flourished from the 6th century to 221 B.C. during the Spring and Autumn period and the Warring States period of ancient China. 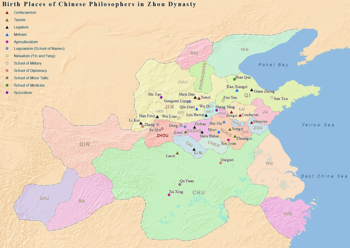 Birth places of notable Chinese philosophers from Hundred Schools of Thought in Zhou Dynasty. Confucianism (儒家; Rújiā; Ju-chia; "School of scholars") is the body of thought that arguably had the most enduring effects on Chinese life. Its written legacy lies in the Confucian Classics, which later became the foundation of traditional society. Confucius (551–479 BC), or Kongzi ("Master Kong"), looked back to the early days of the Zhou dynasty for an ideal socio-political order. He believed that the only effective system of government necessitated prescribed relationships for each individual: "Let the ruler be a ruler and the subject a subject". Furthermore, he contended that a king must be virtuous in order to rule the state properly. To Confucius, the functions of government and social stratification were facts of life to be sustained by ethical values; thus his ideal human was the junzi, which is translated as "gentleman" or "superior person". Philosophical Taoism or Daoism (道家; Dàojiā; Tao-chia; "School of the Way") developed into the second most significant stream of Chinese thought. Its formulation is often attributed to the legendary sage Laozi ("Old Master"), who is said to predate Confucius, and Zhuangzi (369–286 BC). The focus of Taoism is on the individual within the natural realm rather than the individual within society; accordingly, the goal of life for each individual is seeking to adjust oneself and adapting to the rhythm of the natural (and the supernatural) world, to follow the Way (tao) of the universe, and to live in harmony. In many ways the opposite of rigid Confucian morality, Taoism was for many of its adherents a complement to their ordered daily lives. A scholar serving as an official would usually follow Confucian teachings, but at leisure or in retirement might seek harmony with nature as a Taoist recluse. Politically, Taoism advocates for rule through inaction, and avoiding excessive interference. The School of Naturalists or Yin-yang (陰陽家/阴阳家; Yīnyángjiā; Yin-yang-chia; "School of Yin-Yang") was a philosophy that synthesized the concepts of yin-yang and the Five Elements; Zou Yan is considered the founder of this school. His theory attempted to explain the universe in terms of basic forces in nature: the complementary agents of yin (dark, cold, female, negative) and yang (light, hot, male, positive) and the Five Elements or Five Phases (water, fire, wood, metal, and earth). In its early days, this theory was most strongly associated with the states of Yan and Qi. In later periods, these epistemological theories came to hold significance in both philosophy and popular belief. This school was absorbed into Taoism's alchemic and magical dimensions as well as into the Chinese medical framework. The earliest surviving recordings of this are in the Ma Wang Dui texts and Huangdi Neijing. Agriculturalism (農家/农家; Nongjia) was an early agrarian social and political philosophy that advocated peasant utopian communalism and egalitarianism. The philosophy is founded on the notion that human society originates with the development of agriculture, and societies are based upon "people's natural propensity to farm." Syncretism, or the School of Miscellany (雜家/杂家; Zajia) integrated teachings from different schools; for instance, Lü Buwei found scholars from different schools to write a book called Lüshi Chunqiu cooperatively. This school tried to integrate the merits of various schools and avoid their perceived flaws. The (c. 330 BC) Shizi is the earliest textual example of the Syncretic School. Another group is the School of the Military (兵家; Bingjia) that often studied and discussed about what westerners called Philosophy of war. Some of them studied warfare and strategy, others focused on kinds and skills of weapons. ; Sun Tzu and Sun Bin were influential leaders.Some of their famous works are Sun Tzu's The Art of War and Sun Bin's Art of War. Their theories influenced the later China and even the East Asia greatly. They work well in many ways in the modern day. School of the Medical Skills(方技家;Fangjijia) is a school which studied Medicine and health. Bian Que and Qibo were well-known scholars. Two of the earliest and existing Chinese medical works are Huangdi Neijing and Shanghan Lun.